The vin­tage photo of the day is called Saint-Cloud (a sub­urb of Paris, France) by Eugene Atget and was taken in the early 1920’s. 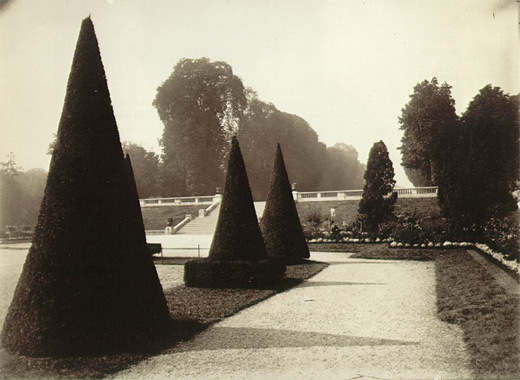 Atget is well known for for doc­u­ment­ing the land­scape, urban­scape, parks and street scenes and of ” Old” Paris‚in the late 1800’s and early part of the twen­ti­eth century. Although newer pho­tog­ra­phers might look at this image and go “meh”, there’s actu­ally lots of inter­est­ing stuff to look at due to the care­ful com­po­si­tion. The repeat­ing cone-shaped trees and their shad­ows are the focal points of the image and their shapes are some­what repeated by the other trees in the back­ground. Great use of lead­ing lines and shapes cre­ated in both the pos­i­tive and neg­a­tive areas of this pho­to­graph make it far more intrigu­ing than it ini­tially seems. The‚George‚Eastman‚house also has quite a good col­lec­tion of Atget pho­tographs for those that want to see more of this Master’s work.